We are trying to learn to blog and we are having some difficulty. Our grandaughter, Lexi, taught us how to add photos in a different way so they are included in the blog. They can also be tapped to enlarge them to fill the screen so you can actually see what we are posting. Now, that having been said, please be patient with us because we are not very good at this yet. The photo above is of me and Sis. 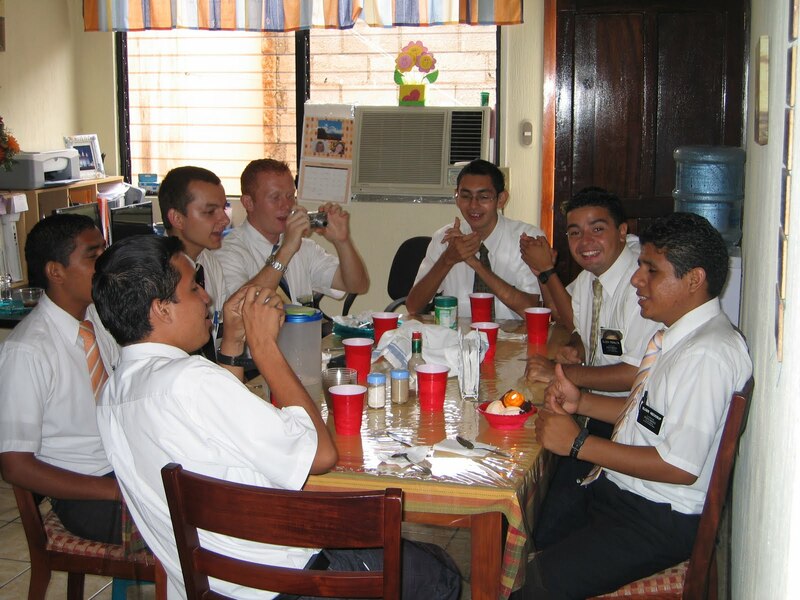 Macdonald with a group of missionaries at the Santiago Missionary Training Center. We give them their vaccinations while they are here in Santiago. All of them are from Latin American countries and have calls to one of the missions in Chile. Since they already speak Spanish, they are only here for 19 days. They sang us a beautiful version of 'Oh My Father" sung to the melody of "Come Thou Font of Every Blessing'. What a treat it was. These new missionaries have such a spirit about them. The next two photos are of a monkey puzzle tree--so named because there is no way a monkey could get into it. Each leaf is a thick and succulent like with a sharp point on it. The leaves go around the branches in circles making each branch a long round spiky extension. There are hundreds or thousands of leaves per branch. It is pretty wicked and rather unique looking. The photos were taken in Coyhaique in the far south. Fall in Santiago has been beautiful. There is a tree planted in abundance around the area offices which has really intrigued us. It changes like a rainbow with a variety of different colors from green to yellow to red to deep purple--almost black. The leaves will be in different stages all on the same tree. I took photos of some of the leaves in their different stages and thought we would post them to show how wonderful they are. On Saturday, June 6th we had our first totally free day. The sky was blue and the winter weather very mild. We decided to take a trip to the largest hill in Santiago, San Cristòbal. It was about a 2 or 3 mile walk to the foot of the hill. Then we took the funicular up to the top of the hill. This is a machine that pulls a train-like car up a hill on a 45° angle. The first funicular railway was built in Italy to go up Mount Vesuvius in the early 1900's. The song 'Funiculi, Funicula' was written to commemorate the opening of the Italian funicular. 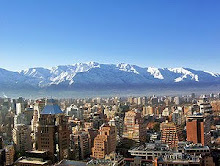 Most days we do not even see the Andes, which are about as close as the Wasatch Mountains are to Salt Lake City. This is due to smog and mistiness. From the top of the hill we had a grand view of the city of Santiago and the snow capped Andes. It was a beautiful sight except for the blanket of smog over the city which is ever-present in the winter here. I'll post a few photos of the Andes and the city from the hill. We have befriended a young woman here--a recent convert from Osorno. She is good friend of Pres. and Sis. Lovell. She moved to Santiago right after her baptism and just happens to be in our ward. We had her over for Sunday dinner a week ago and plan to have her and her friend over once a month. She is a darling girl who has earned a full scholarship to the University of Chile to study law. She met the Lovells by knocking on their door one day. As a school project, they were to collect some type of information and her teacher told her to go ask the Mormons in the big white house. They fell in love with her and have been a great support for her. Come to find out, her mother was a less active member and had never shared that bit of information with the daughter. Now the mother is back attending meetings and a brother has been baptized. Here is a photo of Camila eating hot, home-made apple pie with ice cream. We have also reconnected with a wonderful missionary friend of ours who we met in Guatemala. His name is Franco Peralta. We was a new missionary serving in Ipala while we were in Chiquimula. He was at our home a few times for lasagna dinners before transfers. That was a tradition which we had. We took a special liking to him. His eyes always sparkled with enthusiasm for the work. He helped us find and teach the family of Wyron Morales, husband to Danielle Chabries. They lived in a village above Ipala which was difficult to find. Elder Peralta and his companion met us and took us on the bus and taught the family several times. Elder Peralta was from Chile but that didn't mean much to us at the time. The Executive Secretary to the Area Presidency, who just happened to be our son's Paul's mission president in Mexico, helped us locate 'Elder Peralta'. It turns out that he lives right here in Santiago. We had lunch with him Saturday and that was such a treat. The photo we got of him was very fuzzy so I will post a photo of him at our home in Guatemala. He is the second elder from the right with the big smile. He has brought us wonderful cookies and then Saturday he brought us a cake called 'A Thousand Leaves', a special pastry here. It is made with a thin piece of pastry like pie crust covered with a carmel like sauce then a layer of crust again and then carmel again--hence the name 'a thousand leaves'. There are many layers of the crust/carmel. We first had it at the bed and breakfast in Coyhaiqui. Here's a photo. As you can see, we have almost finished it off. Its pretty yummy. from the Book of Mormon. On blurry one on the right is a map of Chile. Dave's camera is going out and the photos are blurry. Concepción. A senior elder here made a kitty condo for her and she is loving it. sharpens her claws on the carpet rather than the furniture, which is wonderful. Converting people to the gospel is not really enough. Converting them to apple pie completes your assignment. Let's get the message out there! Those mountains seriously look to me like the way I remember the Wasatch Front.